There’s value in better team performance. Values. Every person, team, and organization has them. They’re what make people tick, and smart organizations know that they’re the vital link to employee engagement, team performance, and a competitive advantage. How It Works Personal and team discovery sessions simply and effectively bring values to the surface. 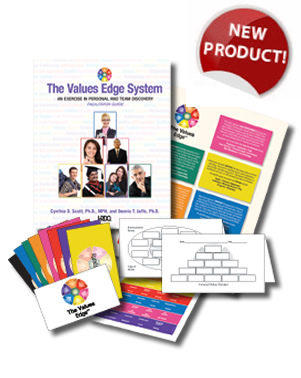 Participants create a hierarchy of their individual value system using pyramid tents, stickers, and cards that represent both intrinsic and instrumental values. What makes these exercises so powerful is that in addition to “seeing” what drives their own actions, individuals get a clear picture of how their values compare to their peers, teams—and even the organization as a whole. What to Order The Complete Kit includes materials to train up to five people at one time. For larger groups, order one extra card deck and one participant refill set per person. The card decks are reusable and all other parts are available for individual purchase. Cynthia Scott, PhD, MPH A founding principal of Changeworks Global, Dr. Cynthia Scott is a subject matter expert with over 20 years of experience in the fields of strategic planning for human capital management, managing continual organizational change, and visionary leadership. She is the author of numerous books, including Rekindling Commitment and Take This Work and Love It!, and her work has been featured in publications such as The Wall Street Journal, Business Week, and Worthwhile Magazine.